Wine production in Lombardia has been present even before Ancient Romans. It was the local Celtic tribes who were responsible for early cultivation. Since medieval times the wine has been purveyed through Milano, which until this day is still the main center for commerce in the area. Often tied to religious orders it was monasteries and abbeys that contributed to the early days of wine making and business. Presently, in traveling through Lombardia you’ll find many wineries located inside of old converted monasteries. Outside of the bustling city center is an array of natural terrain made up of countryside, plains, lakes, rivers and Alps, but the region is generally considered a cool continental climate. This environment makes production styles diverse and winemaking ranges from Metodo Classico bubbles, to high toned Nebbiolo and Pinot Noir, to rare passito wines. 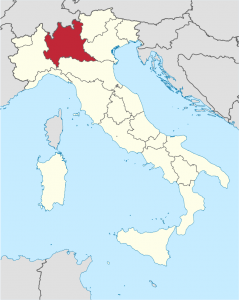 Lombardia continues to be one of the least discussed regions, but possesses a uniqueness and diversity to which a lot can be noted. Although it is connected to the industrial powerhouse that is Milano, it is also home to an abundance of high level craftsman, pristine wine country and lush nature.